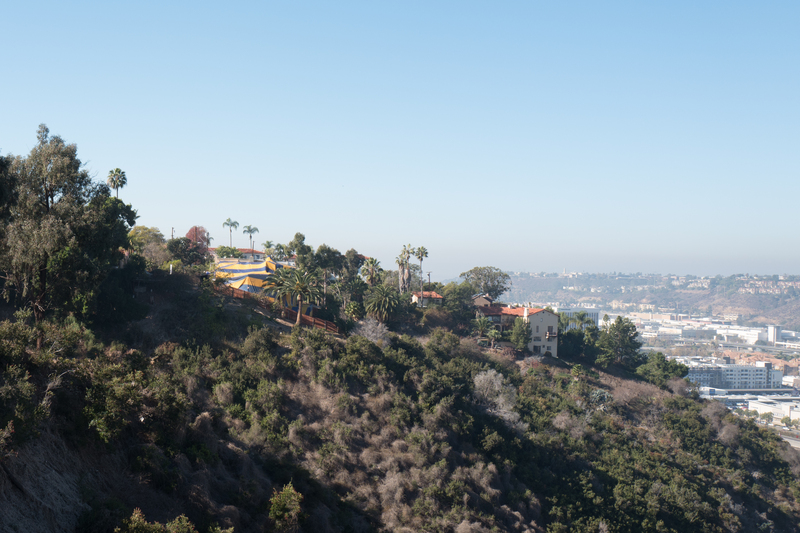 From the Adams Ave. overlook, seen across the canyon to the backside of Franciscan Way, a tented home hugs the hillside. In early Summer, My wife and I walked through the multi-level dwelling during one of its countless Open Houses over the course of many, many months. 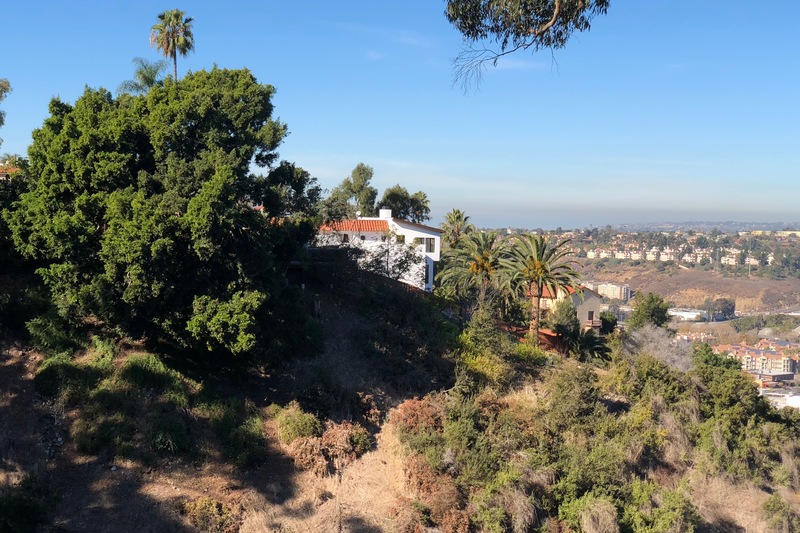 The overly-expansive layout, square-footage (3,860), and $1.7 million asking price were reasons for our disinterest—and perhaps many other people. There is a pending sale, as of the week before Christmas, for $1.55M, which explains the extermination rig. 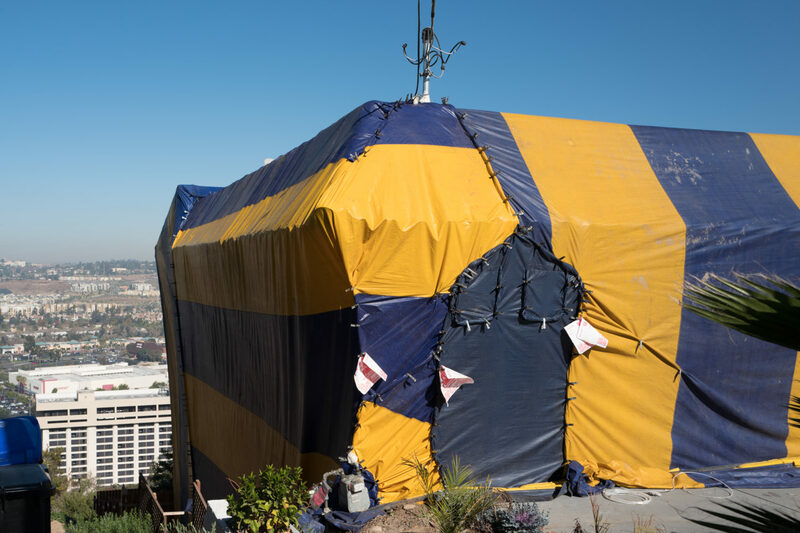 Californians tent homes to fumigate, which is common practice before a new sale closes. Think of it as a temporary tent city for vermin, before insecticide snuffs them out. Funny thing, tent city also refers to where groups of the downtown homeless gather together. If neighborhood banter on the NextDoor social network is revealing, there are many University Heights residents who view indigents as vermin they would like to eliminate. For sure there are homeless encampments down some of the surrounding canyons—infestations as unwelcome by some home owners as terminates. I have heard locals complain that one is as damaging to their property values as the other. I find concerns about increased crime more credible. If the constant news narrative is to be believed, an undersupply of single-family homes is surging selling prices. The Haves foolishly fear the Have-nots. The logic goes like this: There aren’t enough homes, such that demand exceeds supply. Higher demand drives up property values. As they climb, fewer people can afford to buy. But they got to live somewhere, so off they go to the rental market. When demand rises, so do rents, making them untenable for many people—among which a good many become homeless—”legions of Californians without shelter”, according to a Dec. 7, 2017 Associated Press story. San Diego is erecting its own tents as one remedy to the “more than 3,200 people living on the streets or in their cars”. Yes, these different interpretations of tents related to dwellings, fired across my synapses as I spied the yellow and blue coverings. Prison colors, don’t you think? Or Yellowjackets? Who is locking up or stinging whom? The metaphors here are juicy, and I leave them to you. I want to discuss the photos, all shot this morning using Leica Q. The Featured Image was chosen from several made using different apertures, and it is a crop; to repeat, vantage is the Adams Ave. overlook. Vitals: f/11, ISO 100, 1/80 sec, 28mm; 11:14 a.m. PST. I captured the second from the Cleveland Ave. overlook along Golden Gate Drive. Vitals: f/5.6, ISO 100, 1/250 sec, 28mm; 11:22 a.m. BTW, that’s heavy haze hanging in the air, not some optical aberration. Color was accurately captured, as the eye saw from a distance, with lighting and hazy conditions. The the third pic merely completes the set. I originally planned to show off the full tent from behind but instead decided this lesser perspective gives greater sense of what lies beyond, in the canyon and developed Mission Valley below. 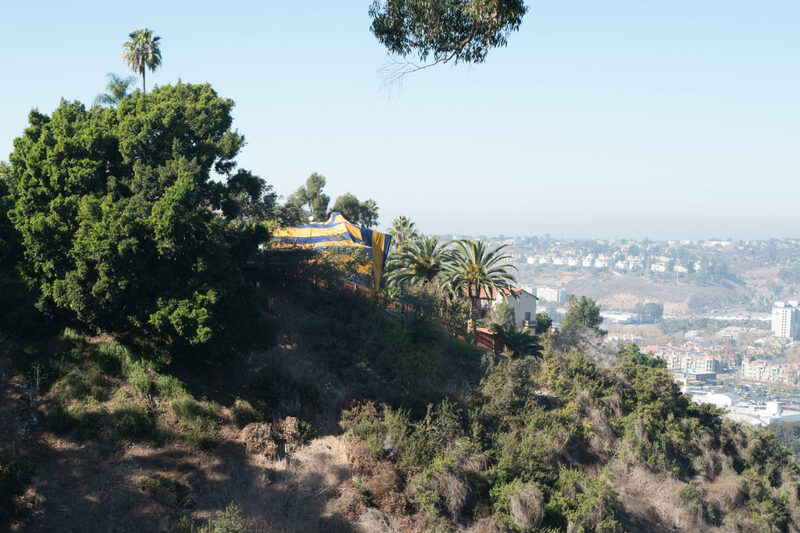 Vitals: f/5.6, ISO 100, 1/800 sec; 11:26 a.m.
Addendum: While walking with my wife along the Cleveland Ave. overlook, on Dec. 30, 2017, I could see the tent had been removed. I captured final photo, for comparison, at 10:41 a.m., using iPhone X. Vitals: f/2.4, ISO 16, 1/873 sec, 6mm.